Hello! Welcome to the March 2016 Kid Lit Blog Hop. This exciting, monthly hop is where we develop an engaged group of people who love everything that has to do with children's literature. Everyone is welcome to join us: bloggers, authors, publicist, and publishers! Our next hop will be April 20, 2016. The hostess will be around to see you soon. New this month, I wanted to highlighted the great work and incredible posts from this community, so I decided to choose a favorite post from last month's hop. If you missed it, please check out Linda's review of Inside Out & Back again over at The Reader and The Book. 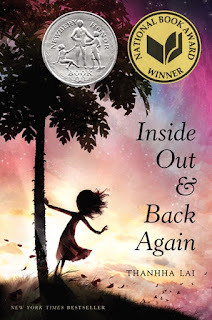 Inside Out & Back Again by Thanhha Lai is the winner of a Newbery Honor and is a National Book Award Winner. Linda shares a thoughtful review of the novel in verse, including a few excerpts from the poems. I also really love the personal connections she shares to her own work as an ESL teacher. Please hop over to Linda's original post to check it out! Thank you so much for sharing my book review from last month, Katie. It is a fine book. And I feel grateful to you for spreading the word through my review. You are welcome, Linda, and well-deserved! I love book reviews that go beyond the summary and that bring attention to such a wonderful and powerful book. Thanks for sharing it on your blog too!